I have come back to Key West an engaged woman. Our trip to the west coast was very eventful, exciting, and busy! We packed a lot of visits with friends and family into 9 days. We began our adventure on Friday, December 22 after work. We managed to finish packing and prepare the animals for our absence and get to the airport on time thanks to a ride from Brandon. We checked in and found our flight was overbooked and they were in need of people to fly the next day. Fortunately enough people jumped at the chance to stay in paradise for another day that we were able to leave on our scheduled Delta flight to Atlanta. The planes that come in and out of Key West are of the smaller variety, and altitude and turbulence are felt stronger than on a bigger jet. By the time our two-hour flight landed at Hartsfield-Jackson International airport I was feeling a little more than quesy. We had about a two hour layover before our flight out, so we rested and I took a dramamine to face the next leg. We arrived into San Fransisco around 12:30am and Gary and Carla picked us up at baggage claim. Once at the Cumpston house, I stayed up for about 20 minutes, long enough to discover that the box of presents I had shipped by UPS 3 day a week previous had not arrived yet. I went to bed and we agreed to try and track down the package in Menlo Park the next morning. I woke up on Saturday when Kevin and Katie arrived from their flight in. Carla and Scott were out "shopping for dad" and trying to track down the UPS package. I heard a doorbell and found the missing package on the doorstep. Scott and Carla arrived back at the house about an hour later and we all drove together to Fogarty Winery up in the hills. 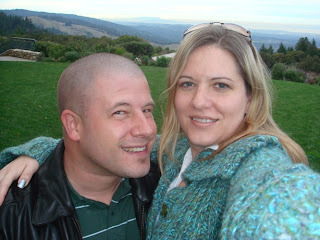 We did some wine tasting and took a couple of fun pictures on the hillside overlooking the valley. We made our way back down to Woodside and stopped at the Woodside Bakery for lunch, enjoying fresh baked bread and wood-fired pizza with leftovers to take home. 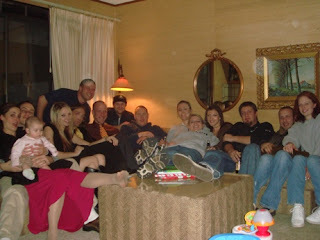 After a nap, Gary, Carla, Katie, Kevin, Scott and myself got in the car and drove to Gary's cousin Doug's house. Doug's wife Liz and kids Ray, Cate and Jane also joined us and after homemade hors d'oeuvres we all went into downtown Palo Alto and sat down to dinner at Spago. After ordering, Scott wanted to take a walk outside for some fresh air, so we crossed the street to a small park. It was quite cold out and Scott had not brought his jacket out of the restaurant, so we walked at a decent pace to stay warm. After making a few laps around the park we stopped next to a park bench, and after he got out of my grip, went down on one knee on the sidewalk and proposed. I must not have answered and he said "Please say yes!" I said yes (of course!) and we went back to dinner and celebrated with the family. 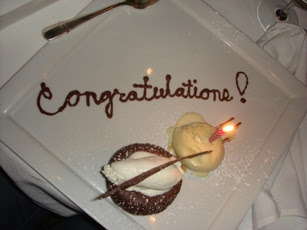 We were treated to a chocolate lava cake with ice cream and whipped cream and champagne. Sunday morning we went back to the jeweler to pick the final setting for the diamond Scott had picked out (astounding in it's own right) and did a little last minute shopping while waiting for it to be ready to pick up. Pizza for lunch again but this time at "Pizza My Heart" in downtown Palo Alto, where we bought t-shirts for $5 each and got a free piece of pizza. Christmas Eve dinner was Potato Cheese soup, salad and paninis. We watched The Devil Wears Prada and then went to bed around 1am. Christmas morning Scott's sister Katie and her husband Kevin ran yelling "Santa was here! Santa was here!" through the house at about 7am. 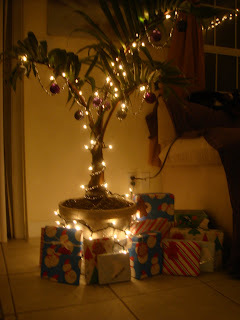 There was a beautiful sunrise through the trees as we opened our stockings and gifts. There was a little time for naps before Doug and his family came over for hors d'oeuvres, and then a quick dinner before Gary delivered Katie and Kevin to the airport for a flight back to Portland. Scott and I stayed up for a little while and then went to bed, only to be woken up at about 12:30 to pile into the car and leave for our drive north. We hit rain going through San Fransisco and it didn't let up until it turned to snow just south of Weed. The snowflakes were about 3 inches in diameter and blowing sideways. We braved the blizzard and it got better by the time we reached Yreka, coinciding with daylight. We finally pulled up to my mom's house in Clackamas right after noon on the 26th. 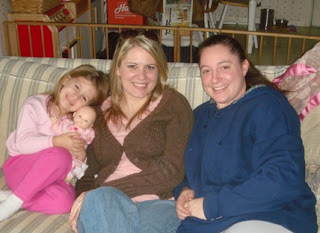 The first visit was to Monica and John Paul's house, where we watched the kids open their presents. Mom had asked that we be back to her house by 5pm to begin preparations for our pseudo Christmas Eve traditional evening. Our evening began with dinner and the traditional lighting of the advent wreath candles, and ended with opening yet more presents and crashing into bed around 10:30pm. Morning of the 27th we drove across town to the home of Keith and Julie Thomson, parents of Scott's brother-in-law. After opening gifts and enjoying homemade shortbread, we proceeded to Scott's Grandma Virginia's house minutes away and opened MORE gifts. Once we said goodbye to Virginia, we drove back across town and stopped at the Ouchida house for about a half hour, where we discovered that Britt and Dan got engaged about two hours after we did. We dashed out to the Oregon City McMenamins to have lunch with Tiffany at about 3pm, and then made our way back to Mom's house to nap. Applebees off 112th in Vancouver was our destination for dinner with Andy, Adam, Kelli and Sarah Rodriguez. They enjoyed their "Chou-lendars" and we shared engagement stories. Thursday morning we met Britt and Dan for breakfast at Jam On Hawthorne and then enjoyed a couple of hours with TJ, Michelle and Taylor at their home in Milwaukie. 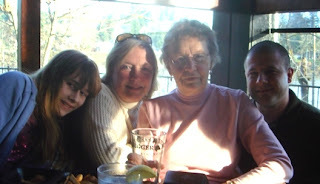 We had just enough time to drive to Mom's to change and then head to The Ram in Lake Oswego for lunch with Carla, Grandma Eloise and Scott's other cousin Jane. In the short amount of time between lunch and dinner, I had the opportunity to spend my Target gift card and a little time at Bridal Exclusives in Clackamas Promenade and may have found THE dress. 7pm found Lou, Mom, Scott and myself parking in the lot at Riverplace, and braving the very cold wind to walk down the plank to the Marina Fish House (previously Newport Bay). Gary and Carla joined us shortly after and we enjoyed a fantastic meal capped off with Gary and Lou sharing a berry cobbler. Friday morning we woke early and drove to Monica and John Paul's house, visited for a few minutes and then delivered Sammey to Brusett's house for a birthday party. Kevin agreed to perform our ceremony, whenever it ends up being. It was great to see the girls at my old office for a few minutes before heading south into Portland. Scott dropped me off at my hair appointment and then we grabbed lunch on the way to visit Julie and Ella. Ella is 4 1/2 and very smart. It was great to catch up with them and we were sorry Keith wasn't able to be there. I dropped Scott off with Andy and spent the afternoon at the downtown Clark County Title branch saying "hi." I met Roxy and her family and Tony at the Spaghetti Factory in Vancouver for dinner, and then sped to Tualatin to meet the gang at Hayden's Lakefront Grill. JVA rocked the place out and I even got to play a little cowbell before TJ took over. It turned out to be a bit of an un-official engagement party, attended by Monica & John Paul, TJ, Andy, Travis, Pete, Jen, Chad, Bill, Bob & Chelsea, and Matt and Tiffany. We stayed until the very end and finally got to sleep around 1am. Saturday morning I got up at 7am and went to Bridge City for rehearsal before singing and playing keyboard for worship during church. Mom and Lou brought Scott for the service and I got to hold Connor for about 1/2 of the message. Scott and Sindos' wedding started just after 2pm a few miles away and then we had a small window of time to pre-pack for our flight out. The wedding reception was at the Oswego Lake Country Club and we bailed after dinner was served. Packing up and loading out managed to only take us about a half hour, helped by the fact that we decided to ship a lot of stuff from Portland to Key West so we didn't have to cram it into our luggage. We arrived at Bob's house around 9pm and had an hour to hang out with Rachel & Gary, Mike &amp; Erin, Monica & John Paul, Brooke & Nate, Andy, Bob & Chelsea, Chris and show pics of Chou to Jeff. After a round of goodbyes, Bob dropped us at the airport and we checked in for our flight back to Atlanta. Scott gave up some toothpaste and lotion at security, and we were able to board our plane without having to wait too long. The three hour layover in Atlanta was taken up by napping, especially after I took a dramamine, which knocked me out hard. The flight to Key West went quickly and smooth, considering I was sleeping. Shaunta picked us up and we were happy to get home and greet the kitties right around 1pm. We are leaving Key West for California in just 3 days. All that remains to be done at home is pack and clean, as we are having guests over New Year's Weekend. We'll put our Christmas tree out on the back porch before we leave so it can have some sun. I found this festive fellow enjoying his holidays on our front porch last night. 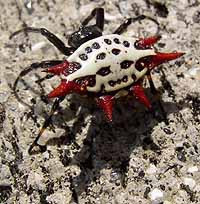 I googled him and he's quite common to the area - a Spiny Orb Weaver. Not harmful, good with bug catching. Anyone want one for Christmas? He's about the size of a dime. One week until we depart for California. We've been notified of a little added time to our layover in Atlanta, but the rest of the plans are still looking good. We finally got a new key to our mailbox and were able to receive the mass buildup of Christmas cards (and bills) that were waiting. The last two UPS shipments of presents are going out today, and my company Christmas Party is tonight. We are enjoying near 80 degree weather every day, and only a little rain. I recieved a text message from one of the tenants in my Vancouver house "you have a tree in your driveway" but I verified with my co-owner that everything is ok, and they only lost power for about 5 minutes. The picture is from Scott's Christmas Party last weekend. I have 2 Christmas presents left to buy or make, 3 boxes of presents to ship out to their destinations. We attended Scott's company Christmas party on Saturday night, and my company Christmas party will be this Friday evening. 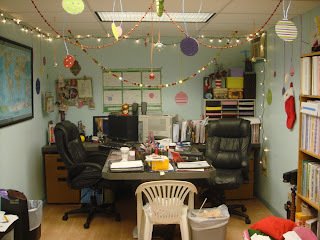 I've been decorating at work since the first week of December, and it's looking very festive, if just a little hodge-podge. The stockings are laying under the counter with care... or in the case of the dog - hung on the cupboard handle, and in the case of the cats, hung on the wine rack above their dishes. Chou still sits under the table, even though the fort of presents has been dismantled. Scott and I are each working just 7 more days and then we depart for San Fransisco. The tree is up and decorated, 90% of the presents are made or purchased. I watched one of my two yearly Christmas required movies on Saturday night: Mixed Nuts. It's a Nora Ephron film with a ridiculous plot and great cast. Steve Martin, Rita Wilson, Madeline Kahn, Adam Sandler, Juliette Lewis, Anthony LaPaglia and Liev Schreiber. I believe the movie was in theatres the Christmas season of 1994. My other favorite is White Christmas (not Holiday Inn) with Bing Crosby, Danny Kaye and Rosemary Clooney.